Another beautiful week is here, love! 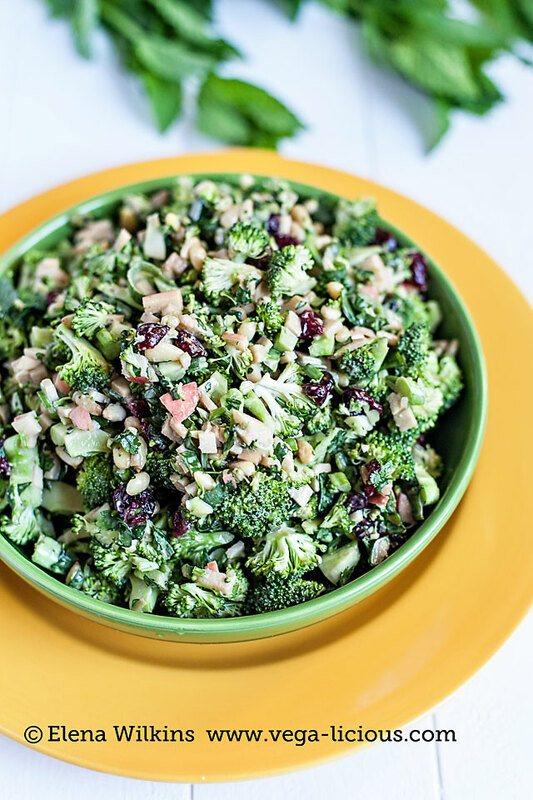 And I have another delicious, nutrient packed, waist slimming, taste bud teasing recipe for you–a Cranberry Broccoli Salad with Pine Nuts that takes only 15 minutes to make. When I first made this salad and tasted it, I thought I was in a parallel universe. See, I don’t really like raw broccoli. While I can eat cabbage nonstop in any form, raw or cooked, when it comes to broccoli I can only get it down and somewhat enjoy it only if it’s cooked. 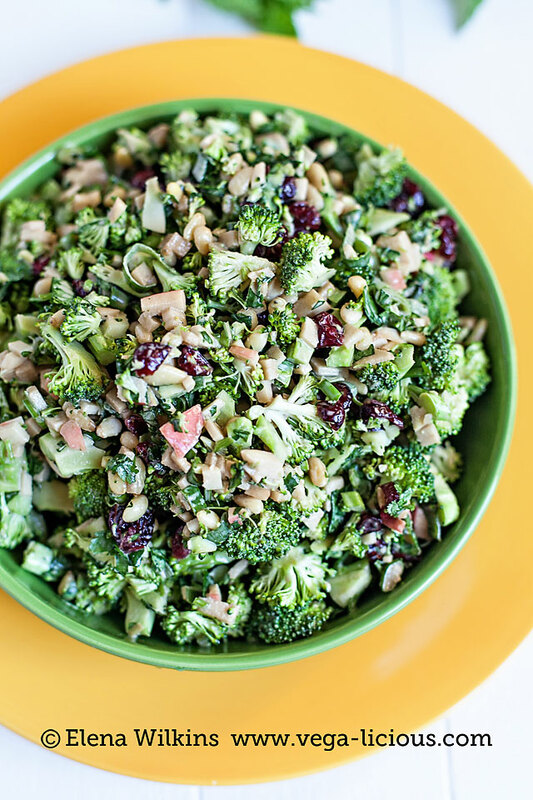 Who knew that chopping broccoli into tiny bite pieces and smothering it with a delicious, two ingredient dressing, can make me love it! I’m glad I found out! Now I don’t have to wonder through my life treating broccoli as a twice-removed step-sister. The salad is loaded with health promoting ingredients. 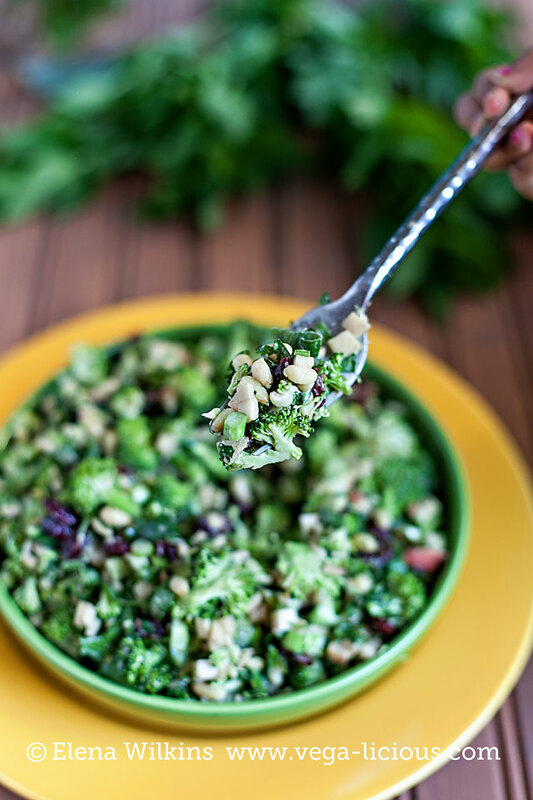 Broccoli, a member of the cruciferous family, is a boastful cancer fighter, which also aids in lowering cholesterol, detoxing our system, helps to keep our vitamin D metabolism in balance, and lessens the impact of allergy-related substances on our body. 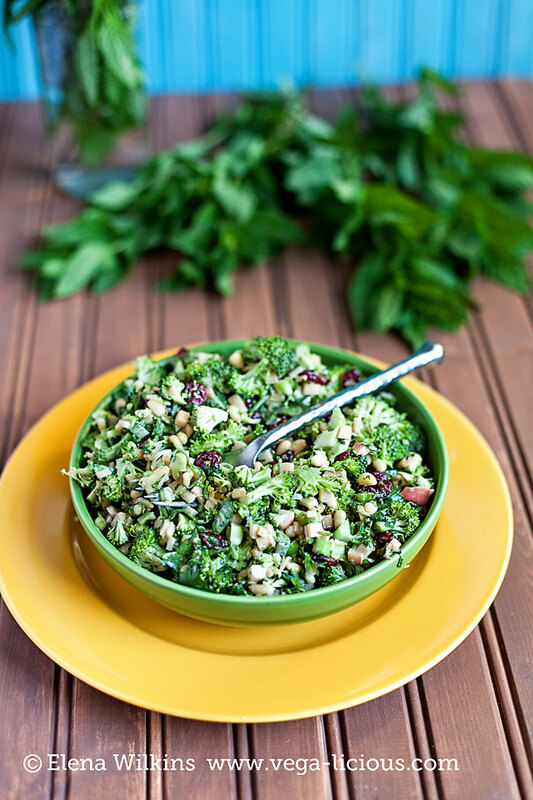 (source) Only 1 cup of broccoli a day will give you 21% of fiber DV! If you remember from my last two recipe, cilantro helps to stimulate secretion of insulin and lowers blood sugar. Green onions, much like their close relative garlic, helps to prevent unwanted clumping together of blood platelet cells and boosts the immune system. Apples, as the saying goes, keep the doctor away, because they help to regulate your blood sugar, and they are great for your gut health. I love my apples crunchy and sweet. When picking an apple for this recipe make sure it is very juicy. Fuji, Gala and Pink Lady apples are my favorites for this reason. Cranberries are great for preventing and treating UTIs (urinary tract infections). Consuming whole cranberries (not juices or extracts and supplements) helps to better protect our cardiovascular system and our liver. Cranberries also possess anti-cancer properties. The cancer fighting benefits are known to extend to cancers of the breast, colon, lung, and prostate. While I can talk all day long about health benefits of the foods you are about to make and devour, I would be totally amiss not to mention the taste, because without great taste who would want to eat these healthy offerings! Right?! Like I said, I’ve always known that broccoli is good for me, but boy…I had to make myself enjoy it. It was a learned skill. 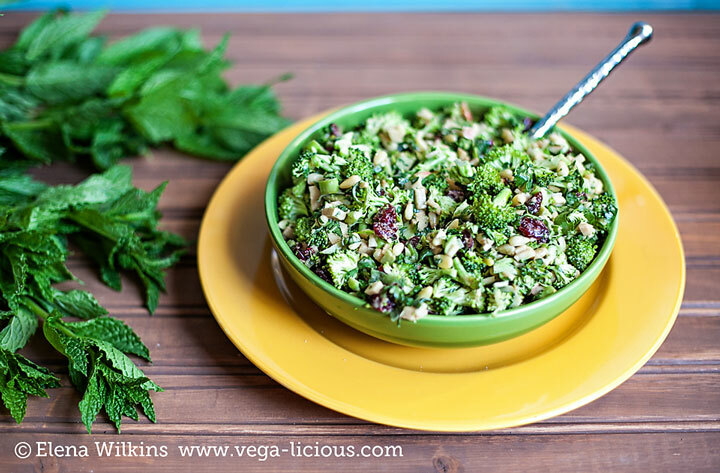 With this salad you get not only the waist slimming, health promoting goodness, but your taste buds also get treated to a feast that is like no other–an exciting stream of saliva inducing molecules hitting your tongue, telling you to take one more bite; a perfect combination of sweetness, saltiness and tartness (or should I be saying acidity? :)) is what humans live for. I know I do. You get all of those flavors with each mouthful of this salad. 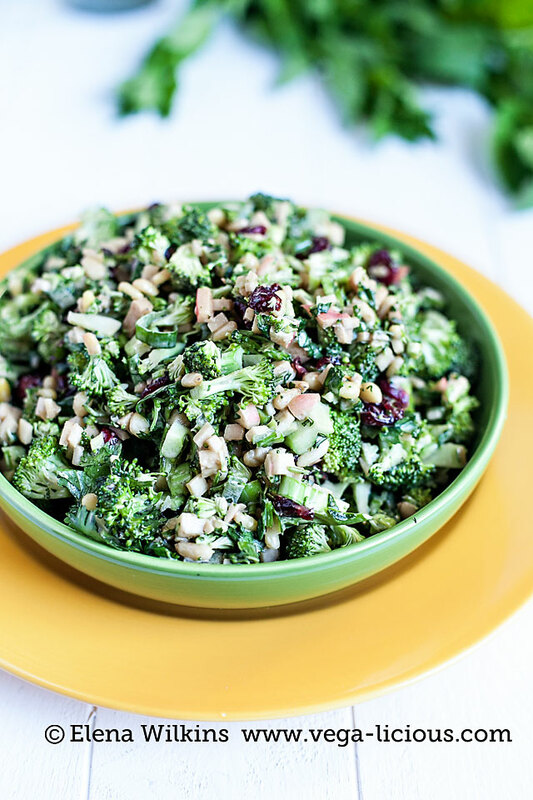 When I whipped up a batch of the salad for this post, Hubby said: “Why didn’t you make more? We will finish this in one setting.” And he was right–I could eat the salad all by itself (call it the main course!) and it would be gone in 2-3 settings. Next time I’m trippling the batch! This weekend we are celebrating Sprout’s birthday–with over 50 guests in attendance (yep, I come from a BIG family :))–I will need at least that much to keep everyone happy. But enough of my chatter. You’re probably salivating. Don’t you let me stop you from doing that. 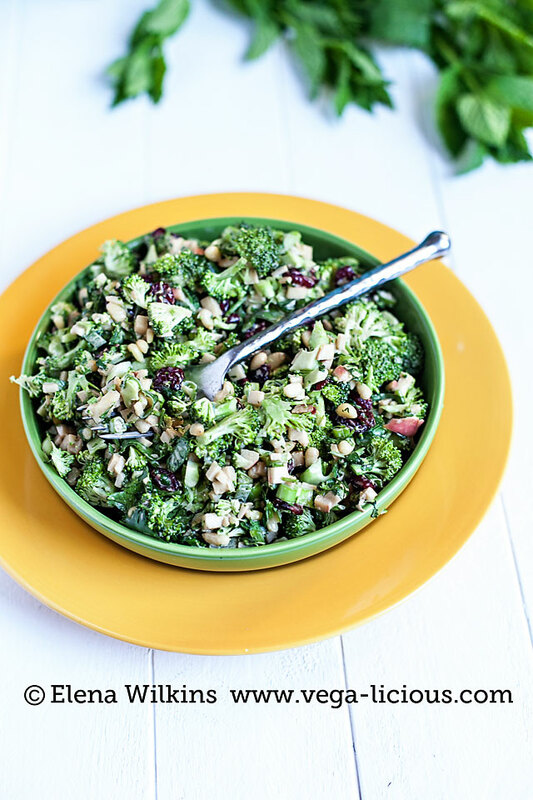 Here’s the recipe to get you started on your first crunch filled broccoli salad adventure. Hubby and I weren’t the only ones who loved this salad. Sprout loved it so much that she did not want to leave my side. 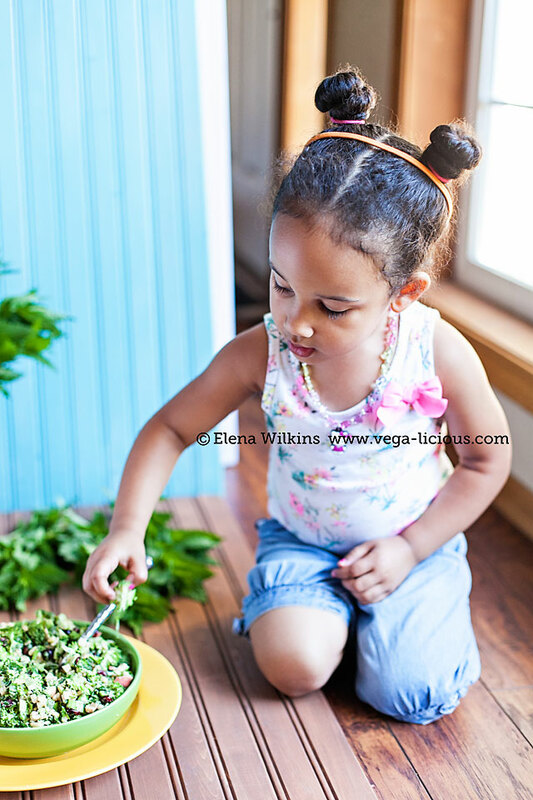 She helped with the photo shoot, while stealing broccoli florets and stuffing them into her mouth. “Yummy!” she would exclaim, and then hum while enjoying the bite.